By 1673 a young and adventuresome Rene Robert Cavalier Sieur de la Salle had arrived in seventeenth century New France, now Canada, receiving a land grant located at the juncture of the St. Lawrence River and Lake Ontario, where Fort Frontenac rose. In the mid-1670s, La Salle designed a scheme for building a fleet of ships to operate between trading posts on the upper Great Lakes, carrying goods, mostly furs, eastward to Montreal for shipment to Europe. La Salle's dreams led him to return to France for royal permission for the venture from Louis XIV and to recruit followers to assist him. Upon return to New France, he plunged into preparations for pursuing his, scheme. An eighteen man advance party proceeded to the Niagara region in November 1678, soon to be joined by La Salle and his lieutenant, Enrico Tonti, an Italian adventurer and soldier known as "the Man with the Iron Hand." Efforts to implement this plan in 1678 led to the discovery of Niagara Falls by the Europeans and to the construction of the first sailing vessel above the falls. On January 22, 1679, the expedition climbed the Niagara Escarpment to move twelve miles south to Cayuga Creek, in present day Niagara Falls, where construction began on the first sailing vessel on the Great Lakes above Niagara Falls. Named the Griffon in honor of Count Frontenac, the governor of New France, the ship was launched into the Niagara River as soon as it was seaworthy and towed up to Squaw Island in present-day Buffalo, where finishing touches were added. 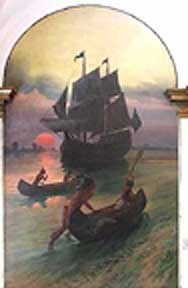 On August 7, 1679, the Griffon sailed into Lake Erie carrying La Salle and his men westward on the first leg of their expedition down the Mississippi. On the return journey to Niagara, laden with furs, the ship mysteriously disappeared without a trace and thus has been dubbed "the Ghost Ship of the Great Lakes "
La Salle died in Texas in 1687.